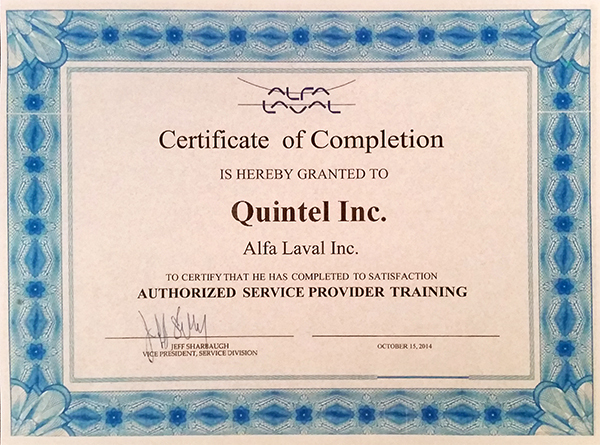 At Quintel, Inc., quality and service are our priorities. We are a family-owned and operated company, located in Northwest Indiana, that specializes in the reconditioning, repair, and remanufacturing of heat exchangers. Since 1994, Quintel, Inc. has been handling jobs of all sizes throughout the country. Our national recognition comes from consistently providing the quality and care that our valued customers have come to know and expect. Our knowledgeable staff and experienced technical crew focus on the details that other companies may overlook. We are equipped with the most modern technology, advanced tools, and efficient testing and recording equipment available. Our positive reputation and close customer relationships make us one of the leading remanufacturers and resellers of all ranges of heat exchangers such as shell and tube, plate, air, marine, and water-to-air as well as oil coolers, inner coolers, and tube bundles. When you trust Quintel, Inc. for all of your needs, you’ll get peace of mind and a finished job that exceeds your expectations. You’ll receive quality care and quality service. Why work with Quintel, Inc.? All finished work is 100% tested under the pressure and temperature you request and it must pass your specifications before being shipped out to you. Our work is done by experienced craftsmen with an average of over 25 years of experience working with all types of exchangers/coolers. Our management staff is hands-on so you can be sure to receive personal attention. We send photos and testing charts to you before, during, and when the job is complete to maintain communication and save you the cost of sending out an inspector. All shipments are placed on pallets and sealed for forklift and/or crane handling. All items are covered and prepped for long-term storage. Our cleaning is done using the most modern ultrasound cleaning system. This is the most advanced, the safest, and the most thorough cleaning process available. Using this ultrasound system ensures that every space – even the hard to reach areas – are cleaned effectively without harming any materials. All work is done following a Quality Assurance Program and an ASME “R” Stamp. This guarantees all materials are within the specifications required. All Stainless Steel work is Hydro tested using Deionized Water. We have a quick turn-around time and a large facility to accommodate multiple jobs of all sizes. We are an Authorized Service Provider for Alfa Laval Inc. 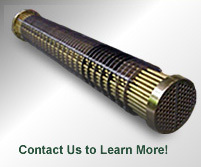 Contact us today to request a quote for your heat exchanger repair or reconditioning.